Jon and I are on our way to Disneyland for our annual Christmas trip. We deplaned in Los Angeles and hurried to the curb to await our rental car company shuttle. The night air chilled us and urged Jonathan to pull on a second layer. December is cold even in Southern California. Once in our chosen vehicle, a white Volvo ("Something German... anything German! "), we hopped onto the 105 and pointed our noses toward Disneyland. We wear ourselves out with work and social engagements, frittering away precious time and energy on frivolity. That's not always a bad thing. Last night we saw The Nutcracker performed at the War Memorial Opera House in San Francisco. It was a spectacle in every sense of the word, and I found myself clapping eagerly, giddy as a child, both in anticipation of the twirling and sparkling to come and in praise of the act which had ended only seconds before. As exhausted as Jon and I were when we arrived at home, the show itself and the conversation with good friends meant it was time well spent. But that's not always the case. Our priorities spin themselves out of whack when we drop the reigns, even for a moment. In the end, and there is always an end to each of these tiring chapters of our life, we find that our blood pressure is up, our eyelids weigh two tons apiece, our senses of humor are dull, our tolerance of people in general is brittle. At those end times, we must escape somewhere for a rejuvenation. Disneyland is our place to refresh our appetite for living. That's why we're here again. (You may recall that we drove down in November, as well.) We are eager to run circles around the two parks, enjoy the newly refurbished Small World ride, sing along with the Pirates and celebrate a macabre holiday with Jack Skellington. So, there we were on the 5, rushing southbound, yearning for the hotel room... the soft king size bed and the cable television. And Jon, as I mentioned was hungry. Utilizing my iPhone, I mapped all the nearest Burger Kings at Jonathan's specific request. There were three equidistant from our place on the freeway. I picked one and directed Jon to the appropriate exit. Just South of L.A., the world is hard and dark. Buildings are mostly concrete. Bars stripe the windows. Doors are kept closed against the shadows and the hostility with multiple locks. I had directed us straight into Compton without realizing it. Seeing the name of the neighborhood sounded an alarm in the pit of my stomach. It's just not the place you want to be after 11 o'clock at night. We found the Burger King, just under the 110. Signs let us know that the drive thru was open late. I let my eyes swing in a radius around our car. Across the street, a lone man loitered by the entrance to a well-lit Shell station. A few cars rolled through the intersection, one with the radio thumping loudly. Jon ordered our dinner. A burger for me. Chicken tenders for him. The nasal, crackling voice of the Burger King employee gave us our total and instructed us to pay at the first window. The man who had been standing across the street pivoted and began walking quickly toward the Burger King. I wouldn't have noticed except that he was the only person I'd seen outside of a car since we'd left the airport. His strides were long and with each step his sweatpants, too short for his legs, would hike up a bit. The light from the restaurant sign allowed me to see his face as he came closer, though the darkness. He was a black man in his late thirties or early forties, more than six feet tall though his posture was a tad stooped. His hair hung in uneven dreadlocks around his face. The jacket he wore was long at the sleeves and unzipped. And then I saw his eyes... large and dark and fixed on me. Our car was his destination. He arrived at the drive thru lane and stepped in front of the vehicle. The sharp headlight beams cast odd, angular shadows above his eyes, clownish purple triangles from his eyebrows to his hairline. And he was dirty, quite dirty. Maintaining his place in front of our car, the man gestured to Jonathan (who had just handed our credit card to the woman at the window). Then, in a low, slanted voice, he asked for money. Jon said no. The man asked for a burger. Jon said no. There was a stiff, eerie moment as we waited for the man's reaction, but no real change crossed his face. He simply turned and walked back to his original stand at the Shell station, slower this time, but that was all. I'd been silent. I'd been fearful. But I'd also wanted to help. We accepted our brown bag of hot food and rolled up the car window before driving onward. At the traffic light, I turned to look for the homeless man. He was there, shuffling on the sidewalk, mumbling to himself. I could see his thick, shadowy lips moving in the yellow, neon light. He was altogether alone, and the night was getting colder. Tonight I am nestled under several blankets on a broad, plush bed. Beside me lies my husband, and I will curl up close to him soon to share his warmth as I give in to my drowsiness. For the next three days, Jon and I will be cavorting in the world's most famous theme park. We will eat whatever we want whenever we want to stop and enjoy a meal, and we'll never have to ask anyone else to help us. 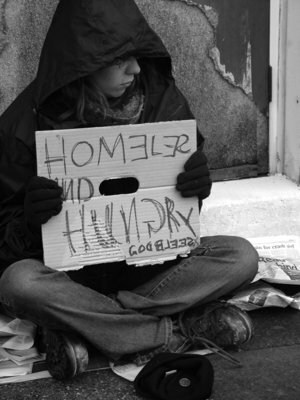 Although I am one who often gives to the homeless, and although I do so without condescension, pleased simply to share some of the plenty with which I've been blessed most of my life, I have never been so ashamed of my stagnation. Jon was right. Compassion and generosity are admirable, but this situation manifested itself in the wrong context, a dangerous context. Stepping out of the car to hand the man a sack with food inside could have been a terrible mistake, inviting trouble. Yet, I remain convicted. I will never forget this night, the moment when a man's begging first shamed me. Is compassion without action worthless? Am I guiltless in this one instance because of the times I have approached someone in need and handed over money or food or a gift card and a kind word? If I were to be called to God tonight, how would I be judged? Tonight there is a man who lives on the streets of Compton. I pray that someone braver than I will give of himself or herself in order to provide for "the least of these."